The coral reefs and plentiful diving of Maui might be hard to find here on Oahu, at least from the shore, but our first dive since moving here provided lots of thrills. Moray eels, spinner dolphins, turtles, eagle rays, an octopus, three leaf scorpionfish, and five kind of nudibranchs. Not a bad haul as far as marine life is concerned. Check out some of the pictures from the two hour dive at Electric Beach. Electric beach is one of the most popular shore dives on Oahu's west coast. I had never been past Pearl Harbor before in that direction so this was breaking new ground. The west coast is very dry with a ridge of mountains coming right down to the water. 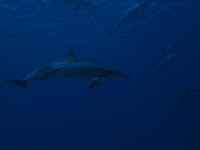 Very beautiful, especially when you pull into the parking lot and immediately see spinner dolphins playing just offshore. One unique feature of this spot, is a large factory on the inland side of the road which has two underwater hot water outlets a little ways offshore. Fish gather in the warm water which you can see creating white caps on the surface. There is a lot of power from the outtake flow and we were warned not to get into the jet stream while on scuba because you might be shot up to the surface. It all went well and we found some wild blue dragon nudibranchs huddled around their eggs right on the side of the pipes. Photo by Heidi Miller. 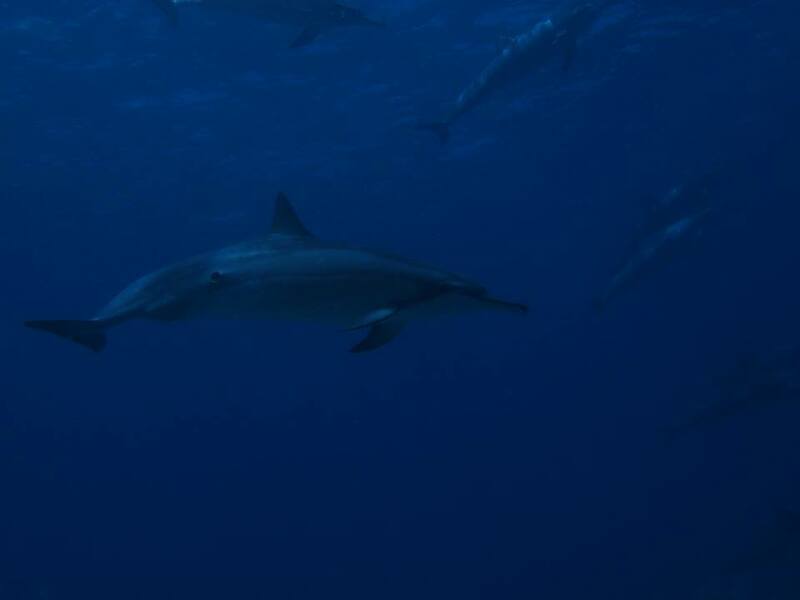 We had a fun visit from some friendly Hawaiian Spinner Dolphins on our dive. We could hear them almost the entire time. A nudibranch eating eggs of another nudibranch! Sometimes a regular sized photo just isn't enough to capture the scene. Luckily my super wide angle lens can be useful for more than just underwater photography, it takes great panoramic shots. Here are a few of my favorite from my first week on Oahu. From cityscapes, to tranquil towns, lonesome islands, and contemplative ocean lovers....Oahu has it all. Lonely Mokoli'i Island. I really want to kayak out and explore it. A smooth transition always makes a move feel a little bit easier. Everything came together for our island hop move from Maui to Oahu. We shipped our car packed full of our stuff. We bumped up to first class on the plane to get more bags checked. Our rental car was super cheap thanks to the low season. I did notice a few new scratches in the car when picking it up from the shipping dock but they just blend in with the others so no worries there.Then we drove to Manoa to get all settled in at Heidi's family friend's place. I felt like that was a pretty good setup for day one in a new place. So we set of in our rental to explore the island and hopefully meet up with old friends. Manoa itself is a green oasis sitting up the slope from the hustle and bustle of Waikiki. There is a beautiful view of the cityscape from our temporary backyard. Heading over the mountains we checked out the cool town of Kailua. Lots of boutiques, health food stores, and art shops line the streets. The winds were light all the way up the west coast. We stopped at a few overlooks and scenic points. We also passed many others that I want to go back to when the lighting is right. Somewhere along the way we got in touch with our friends on the North Shore. We made plans to go meet them for drinks, food, and a beautiful sunset. Looks like this island is a good fit for us already. Let's say you only have one more day on Maui... where would you go? I know my answer, Haleakala Volcano. At just over 10,000ft it is a view unlike any other on the island. It can be fierce winds and sub freezing temperatures. There can even be snow and ice. But the view is worth it. And now being the middle of summer it can be downright pleasant finding a comfortable spot and enjoying how the view changes through the different colors of dawn. We found a spot right along the crater rim to usher in the sun. When we first arrived the stars were out with the constellation Orion visible above the horizon. You can even make it out in the picture above. Look for three bright stars in a line, that's his belt, and three more in a line jutting off diagonally from the belt, that's his sword. Science city where our Maui observatories and astronomers peer into the night sky was lit up with a pink sky at one point. There were so many changing colors it was hard to figure out where to point the camera. Not being a secret sunrise spot, the moment the sun appeared there was a audible murmur of awe from the many onlookers. Unless you are totally enveloped in a cloud I can't imagine a bad sunrise up here. Hikers cast long shadows as they got an early start down the sliding sands trail deep into the Manhattan sized crater. Mauna Kea and Mauna Loa, the massive volcanoes on the Big Island, look like floating islands in a sea of clouds in the background. On the way down we stopped at Hossmer's Grove located just inside the park entrance. There is a quick little nature walk that goes to this gorge where scarlet colored Hawaiian honeycreepers flutter from treetop to treetop. This is a wonderful place for bird enthusiast or anyone who wants to see something you can only see here in Hawaii. After the beautiful start to the day I spent a while trying to figure out the best place to take in our last Maui sunset for a while. After getting a call from my friend saying he was going to be surfing with his son out on the North shore I knew the place I had to be. While cheering my friends on from the upper parking lot at Hookipa beach park the sun gave us one final farewell. Maui has been too kind. Back on Maui for a quick visit we had to fit in a dive at one of our favorite shore dive locations, five graves. This is the same location that all the tour operators have dubbed to be "Turtle Town", but we weren't going diving for turtles. Instead we look for nudibranchs, frogfish, and other hard to find creatures that may escape the usual glimpse from the snorkel masses. Our dive quickly turned into a moray eel bonanza. We had several dwarf morays, cute little 6-8 inch fully grown, and some huge white mouth moray eels about 3 ft long. An undulated moray showed off its razor sharp teeth and a zebra moray contrasted with its toothless grin. As I tried to get a picture right down the mouth of the undulated a large fish swam in between my camera lens and the eel. This happens sometimes as I concentrate on getting the picture, but this time the fish stayed there, which is a little abnormal. So I glanced up, over my camera only to come face to face with a huge white mouth moray eel inches away, mouth agape. After a little initial shock, I realized that this eel wanted to get in on the cleaning action that the other eel was getting. Little cleaner wrasse zipped around picking off dead skin, parasites, and food particles. My patience paid off when one of the little cleaner wrasse boldly swam inside the mouth of the eel! I witnessed this several times before being called off by Heidi to go see a baby yellow frogfish! Ewa Fang Blenny, these fish mimic the movements and coloration of cleaner wrasse to get close to fish. Then they take a bite! We didn't end of finding too many nudibranchs on this dive but the fish made up for it. Baby frogfish, Ewa fang blennies, and a scorpionfish showed up. We did manage to see a couple of flatworms, a kangaroo nudibranch, a violet-gilled, and some egg eating nudibranchs all chowing down on some spanish dancer nudibranch eggs. The bright red coloration of their pigments means they have been eating a lot of the pinkish eggs. What a trip. I got to explore a bit more of Vermont, enjoy some great weather, add a new country to my all time list, and spend some quality time with some great people. All of these pictures are from the last night in Vermont, which was spent on Stave Island out in the middle of Lake Champlain. The pictures speak for themselves as to how picturesque this little slice of heaven can be. But this is just an added bonus. The real draw is the good vibes, the sundowners, bathing in the lake, time on the water, walks with Finn, and Heidi's family. I wouldn't have wanted to spend my last night here any other way. After watching an incredible sunset I was blown away by an equally amazing full moon rising. A slight breeze keeping the cool Vermont air lapped up against us through dinner. The setting sun seemed to make the red house and cottage pop against the sky. The sun set over the New York side of the lake, backlighting the Adarondacks as it went. Stave is a wonderful place to watch the sunset, and everything seems to stop here until the spectacle has passed. Even then the changing colors only make it more beautiful. Once everyone headed off to bed I stepped outside to bask in the light of the full moon. It was a rare opportunity to see colors lit up on the buildings, trees, and flowers but have stars out above. With the help of some long exposures I was able to capture a little bit of this phenomenon. I wanted to paint a different side of Stave that is not usually seen. If you look very closely, you can even pick out some major constellations watching over the island.